As Barney naps, the most beautiful doglike part of his face looks surprisingly the same as on dogs that look nothing like him. It makes sense that the construction of the nose, even the outer parts we can see, helps make it a powerful tool for finding missing persons, crime victims and chemical markers of human illnesses, as well as food, potential mates and lost chew-toys. 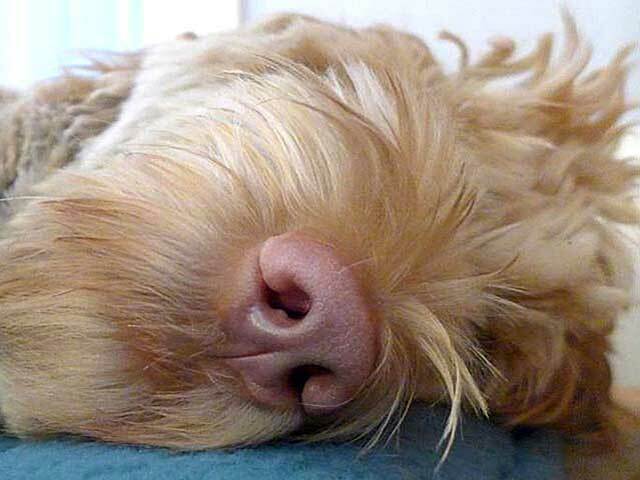 The dog’s nose separates its smelling air-flow from its breathing. When the dog isn’t actively sniffing for odors, the nose diverts only about 12 percent of its intake into a maze of hundreds of highly sensitive olfactory receptors at the back of its snout that trap bits of scent for analysis. The rest goes into the lungs for breathing. If the dog gets interested in sniffing, however, it flares its nostrils — right and left separately, because it smells in stereo! — and pulls air into its olfactory recess. To accumulate more of a faint odor for analysis, a sniffing dog can draw in a continuous stream for as long as 40 seconds, during which it can take as many as 30 quick breaths for respiration. During sniffing, the dog closes a structure called the alar fold that forms the familiar little horizontal slits under each nostril, and it expels its respiratory air-flow down and out the slits. Exhaling normally through the nostrils would blow fresh odors away, but the dog’s nose directs the warmed air to the ground, whirling up a vortex of odor particles for further sniffing. Meanwhile, the dog’s very long tongue maintains the nasal mucous that snares scent particles. To keep things moist, another structure of the canine nose — the philtrum, a little vertical cleft etched between the two nostrils — catches moisture transferred from tongue to nose. These clever design details are something else to admire while pondering your sleeping puppy. PBS’s Nova shows in detail how a hunting dog’s nose works. Scientists study the dog’s nose as a tool to detect incredibly faint odors that mark cancer in humans. More pictures of our puppy, Barney.